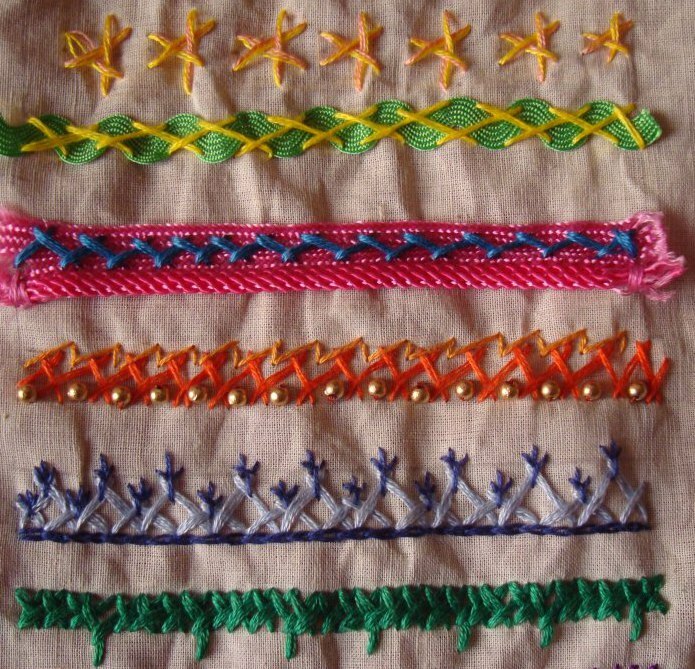 6 –In this row herringbone stitch is combined with zigzag stitch and detached chain stitches. 7-closed buttonhole stitch is worked along with herringbone stitch. 8-I tried forming a triangle with the basic herringbone stitch. 9-the herringbone is stitched over ricrac . at last I got the knack of it! 10- this row of herringbone is over a lace. 11-slanted herringbone stitch with slated zig zag stitch with beads. 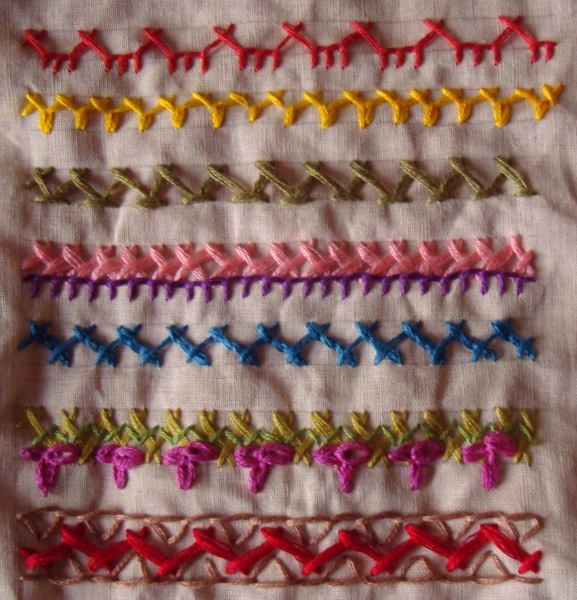 12- this row is a combination of herringbone stitch, fly stitches and chain stitch. 13-three herringbone stitches with a Cretan stitch worked in between. 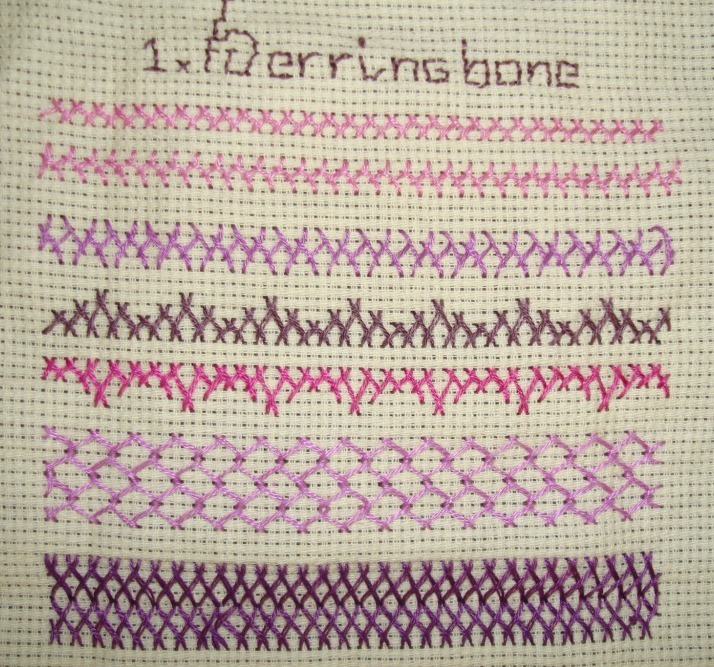 14-this row is a combination of herringbone stitch, detached chain stitches and back stitch. 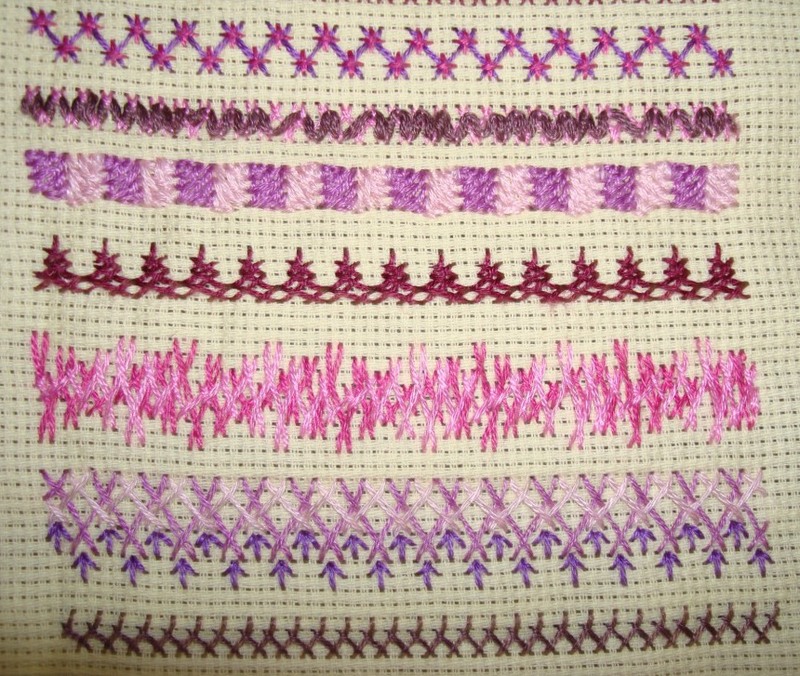 15-two rows of herringbone stitch with beads . 16-3 rows of herringbone stitch with bugle beads. I completed my herringbone stitch sampler with this row. I am leaving tomorrow, for a short trip to India for a week. I ‘ll probably miss the next week’s stitch announcement.so will not time to catch up and this week’s stitch herringbone [TAST 2012 challenge by SharonB] has to be done in a hurry. 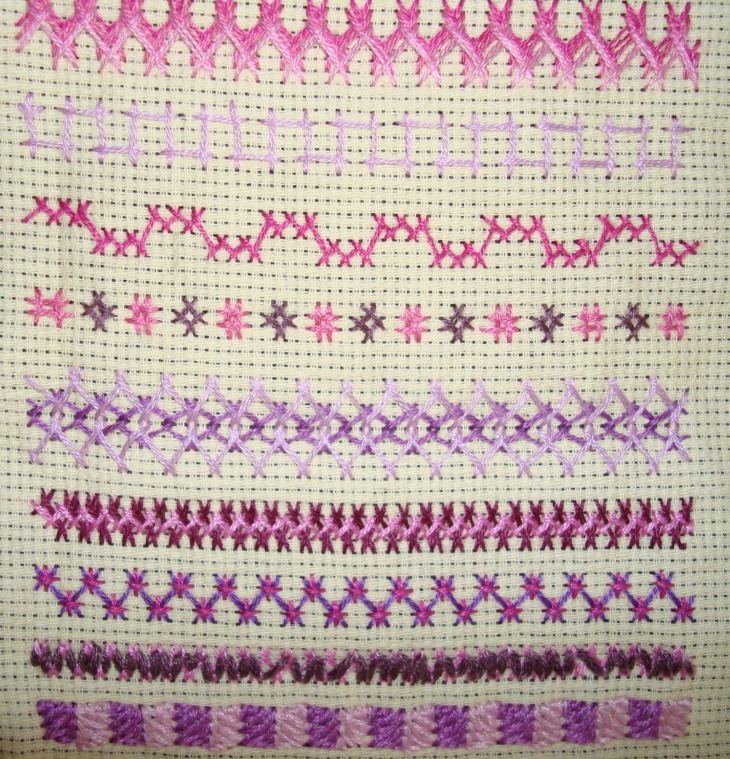 After looking at my earlier sampler, I am not having too many ideas for variations now. Still I thought I might try and use other stitches on herringbone stitch itself. 1-this row is herringbone with buttonholestitch. 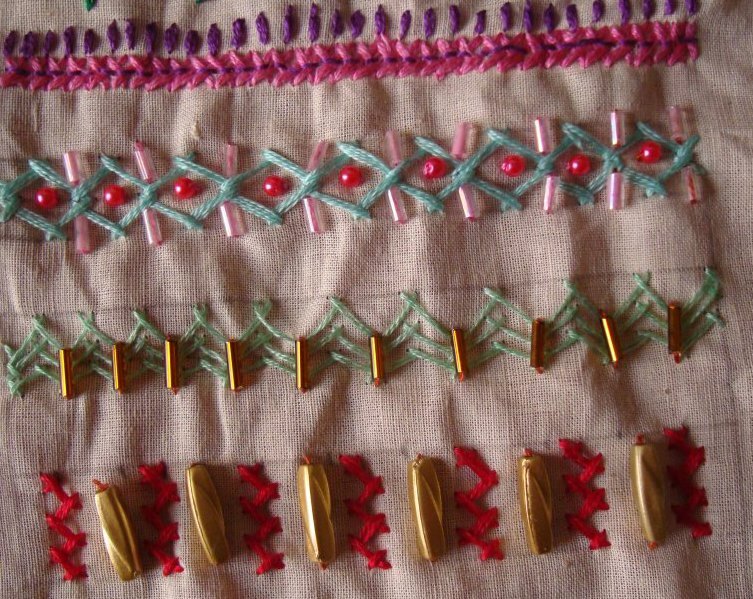 2-this row is with chain stitch. 3-this row is with chevron stitch. 4-this is a combination of open and closed herringbone with buttonhole row. 5- this herringbone crossed with three chain stitches. I might continue if I have time to work and take pictures tomorrow. Otherwise it’ll be next week.